On the Fourth of July we awoke to blue skies and sunshine – a good omen to start the day’s exploration of Glacier Bay. 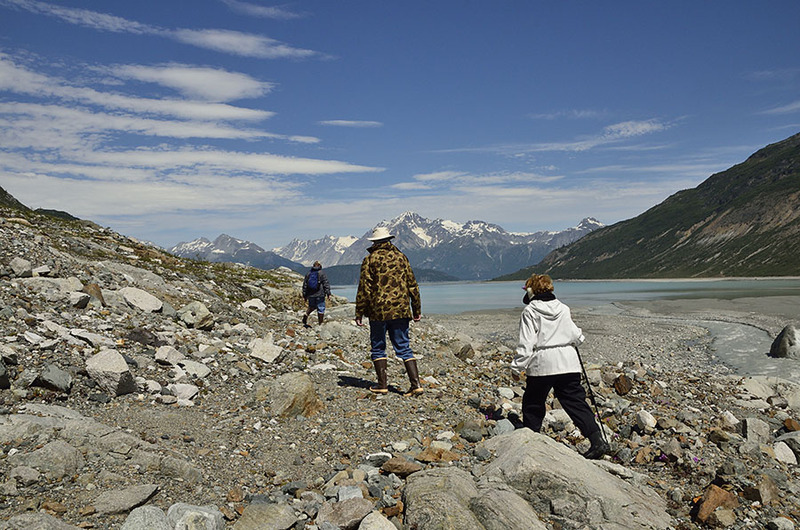 Our plan was to head up to Tidal Inlet to look for bears, do a slow pass by Gloomy Knob to look for mountain goats, head through Russell Pass to look for the wolf that had been sighted recently, and then anchor just off the Reid Glacier for some hiking. Otters and whales and eagles kept us company as we cruised towards Tidal Inlet, where there is a wide gravel flat cut by streams. 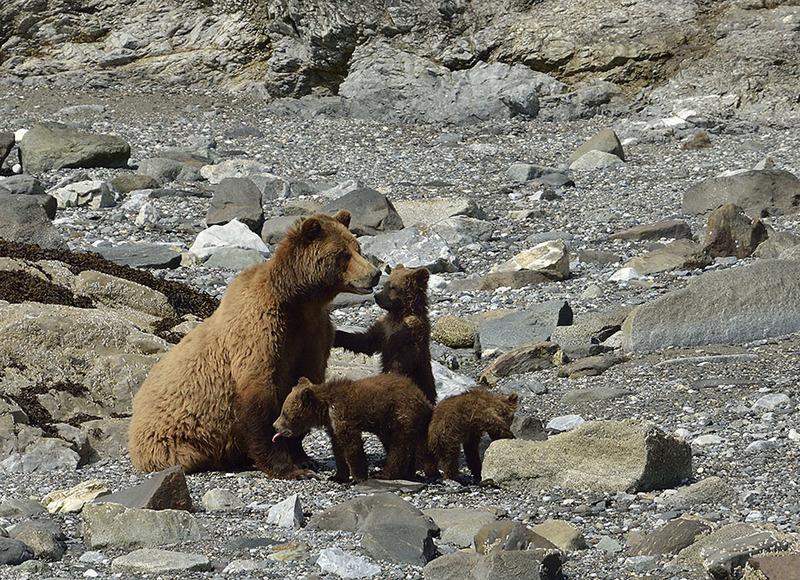 It’s a good place to look for bears, and luck was with us – we spotted a brown bear sitting with a little cub running all around her, frolicking. The bears were a good distance away from us, but we nosed ADVENTURES close to shore and watched until our shoulders ached from holding up binoculars. The sow started walking across the gravel delta, crossing the largest stream with ease while her cub bounced along behind her until he got to the deep rushing water and hesitated. Momma bear kept walking and didn’t look back – a bit of “tough love” – and the cub finally took the plunge into the fast moving water and struggled across. After a good shake, he caught up with his mom and they disappeared into the woods. Light winds allowed us to just drift in the deep waters of Tidal Inlet for a little lunch break, and then we rounded the corner towards another beach and Gloomy Knob to see what else we could find. 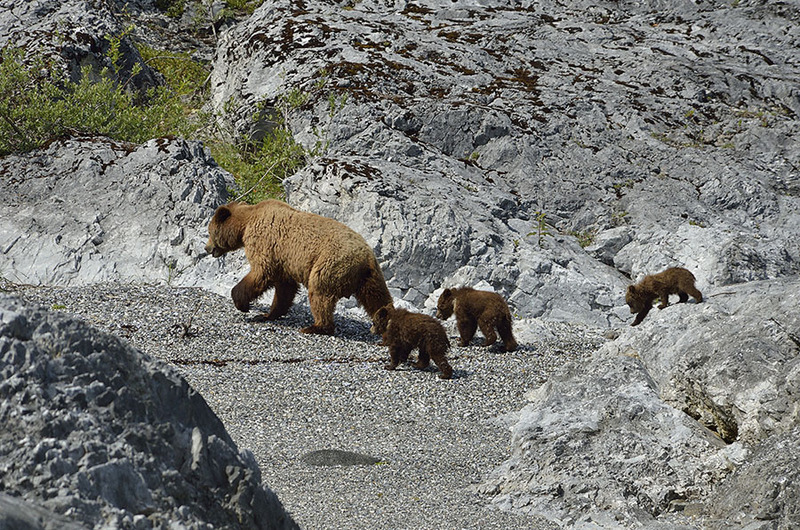 We had heard reports on the radio about sightings of a brown bear sow with three cubs over the past week, but the last report was for a spot farther north than where we were. 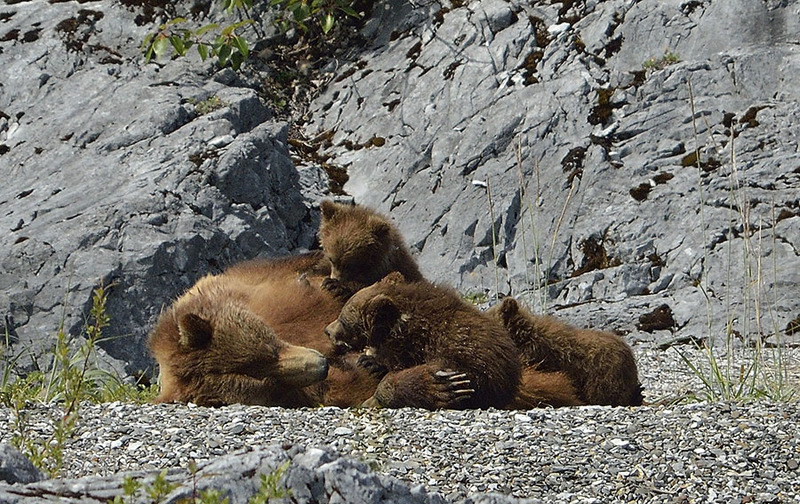 It’s unusual for a bear to have three cubs so these bears are of great interest to the Rangers. Approaching the beach with ADVENTURES, I was almost ready to start turning away when Jim yelled “Stop!!”. 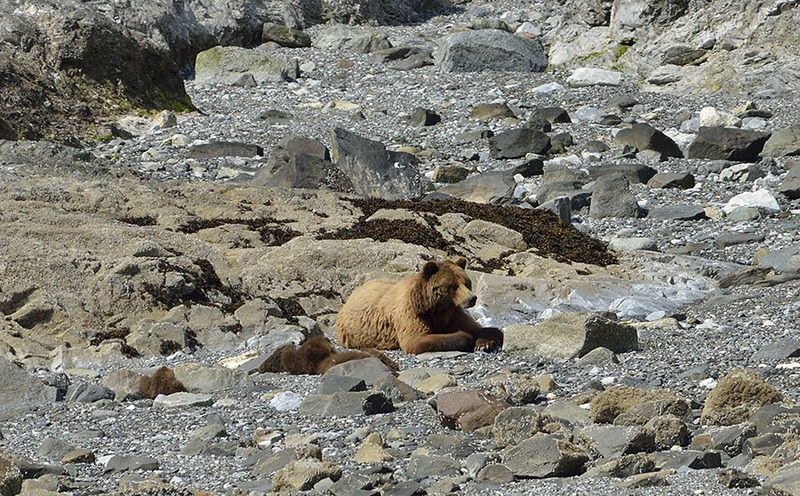 There, on the beach, was a big brown bear laying down for a nap. The bear would occasionally look around, but then put its head back down on its paws and go back to sleep. As we nosed the boat closer, we started to see some rocks that were decidedly furry, and realized that we had found the sow with the three cubs – YOWZA! From a distance of about 150′ and the safety of the tall bow of ADVENTURES, we watched this little family napping and snuggling together, and then sitting up. The sow looked all around, didn’t pay any attention to us, and then walked a short distance to another spot on the beach… …where she flopped down on the ground on her back, clearly a very tired mother. Talking with one of the Rangers a few days later, she commented on how large this bear’s claws are… as you can see. 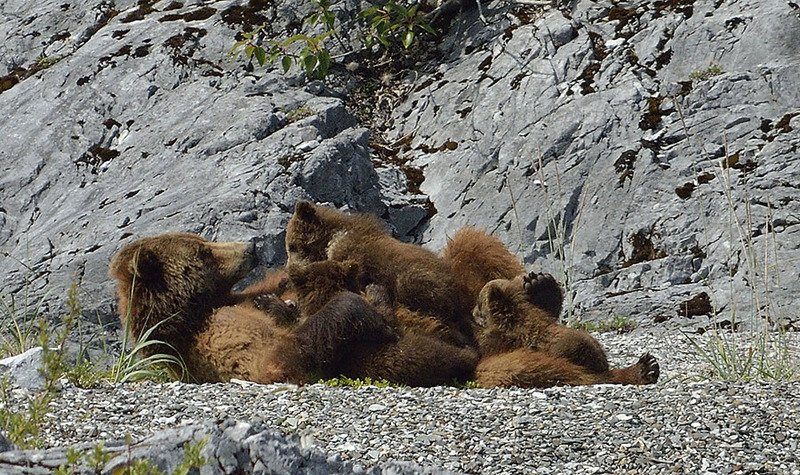 The cubs eagerly began to nurse as we sat in awe of this incredible sight. She cuddled and stroked each cub with one of her paws while they nursed – so tender and gentle. Reluctantly we left the little family to nurse and nap, speechless at our good fortune to see such a sight to make our July Fourth a memorable one. 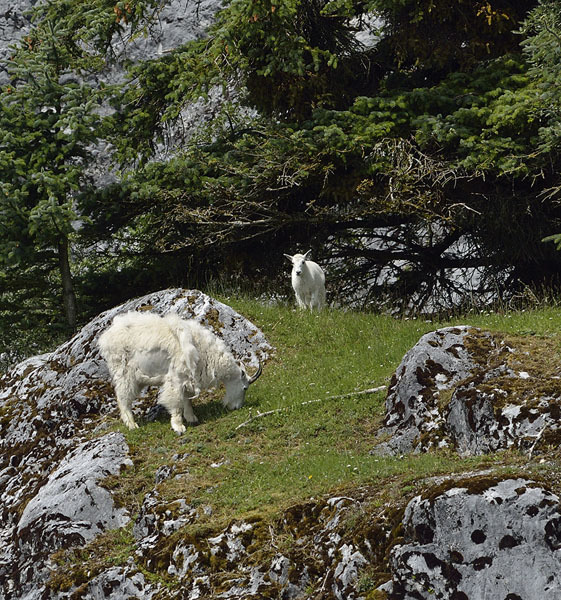 Rounding the corner to cruise slowly along a scoured cliff called Gloomy Knob, we were looking to see if there was any activity by an eagle’s nest when we spotted several mountain goats – nannies and kids! The nanny in the photo above was shedding her coat, and I could just imagine the wonderful sweaters that I could knit with that wool. Higher up there was another nanny and kid, and the little goat was really struggling to find a way down to its mother. 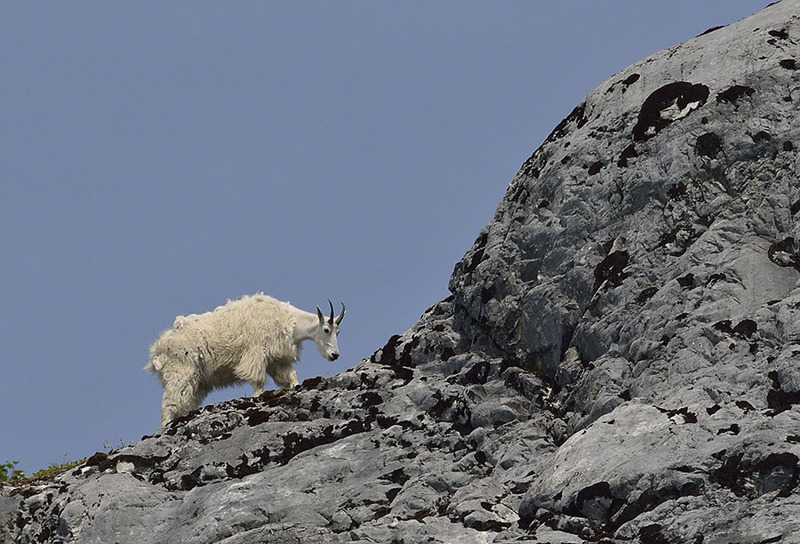 It eventually did climb down to her, learning to be brave on the steep rocks as mountain goats need to be able to do. We were hoping for a wildlife trifecta and that our good luck would reward us with a sighting of a wolf, but that remains an elusive animal on our wish lists. Capping off the day we dropped the anchor in a little bay by the Reid Glacier. It’s a great treat to be able to watch the changing look of the ice as the sun moves across the sky. After a good night’s sleep and a chance to rest our tired shoulders (from holding binoculars all day), we were ready for some hiking. 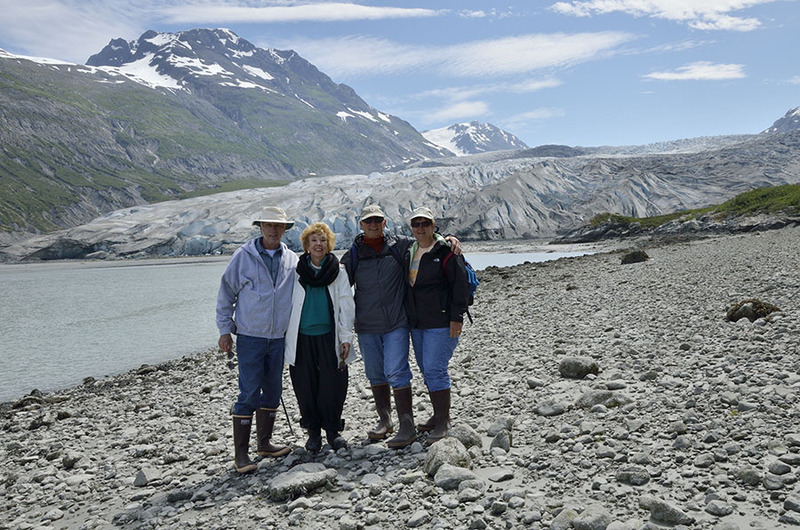 Along with friends Hank and Nancy, we anchored the dinghy on the rocky shore and hiked across a landscape that was scoured by the glacier as it retreated over time. 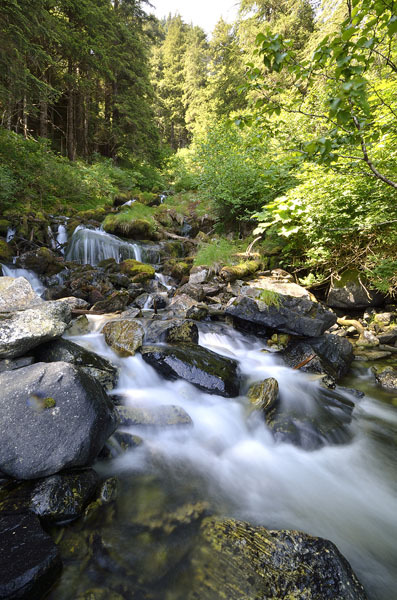 Snow and ice melting create many little cascades and streams, and fireweed and a few other flowers are starting to grow, pioneer plants putting nitrogen back into the ground which will eventually help larger plants and trees to establish themselves on the rough terrain. Our goal was to climb to the side edge of the glacier and touch the ice, and we were able to scamper up on the ice, investigating rocks that were carried great distances as the glacier traveled, perched on top of the glacier looking very out of place. We continued to have perfect weather – clear blue skies and light winds, and it’s not usual to have such a long string of dry sunny weather in a rainforest. 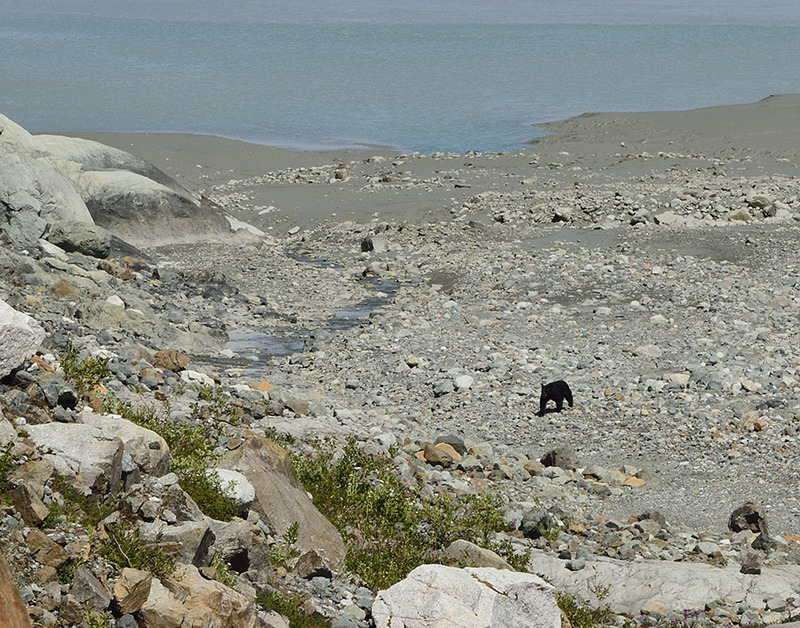 As we were heading back towards the dinghy, we spotted a black bear down on the beach. 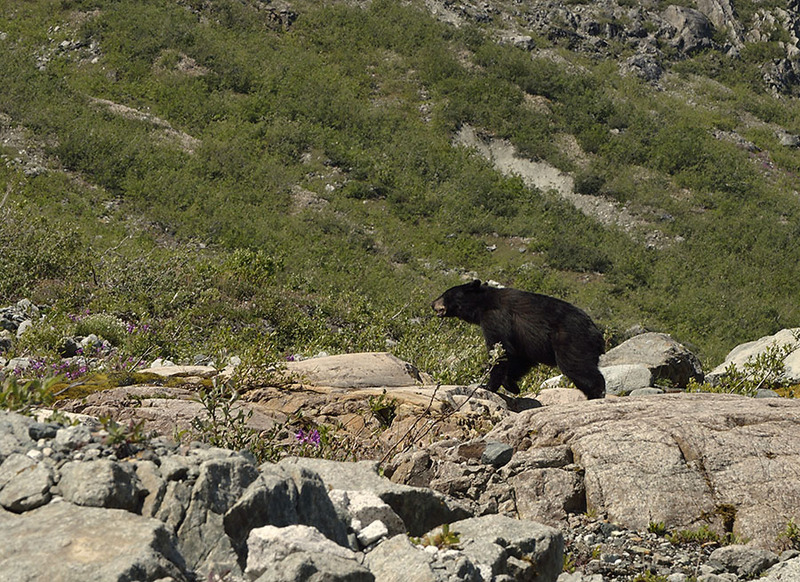 The bear was a good distance away, and we were excited to see more wildlife, especially in the stark landscape. Jim was ahead of us, scouting a path over the rocks and down towards the dinghy when the bear decided that it preferred the same path that Jim wanted, and it started to walk up towards him. Jim clapped his hands and talked to the bear to make sure it realized that humans were present, and the bear veered off and took a higher trail. 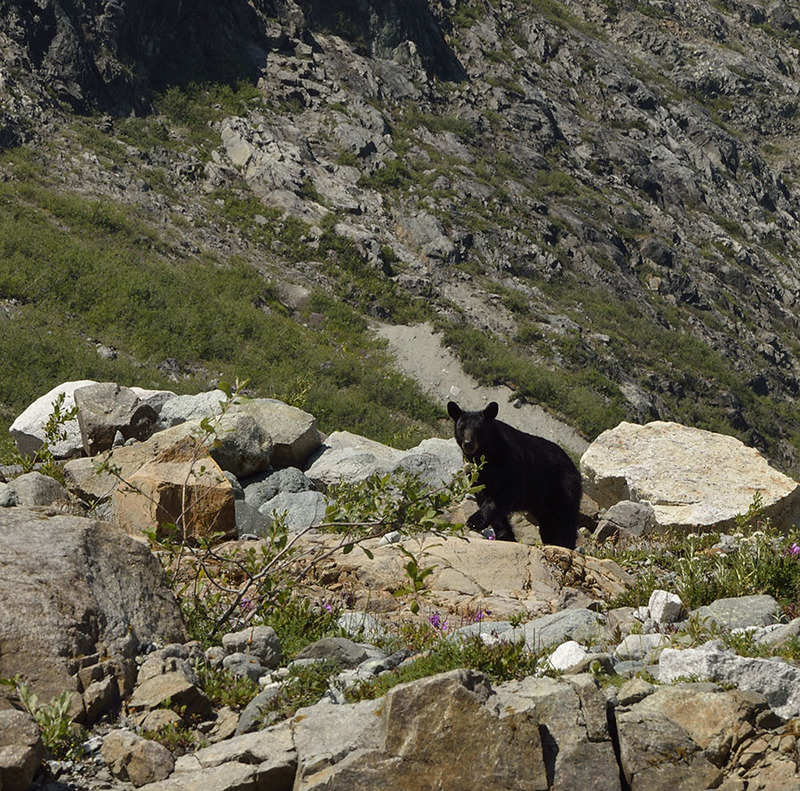 As the bear rounded the boulders it could see three of us standing together – you can see it perked its ears up… …and as soon as it got a good look at us, it hustled away. I would say that those might be the best two days we’ve ever spent here in SE Alaska so far, in terms of wildlife encounters. 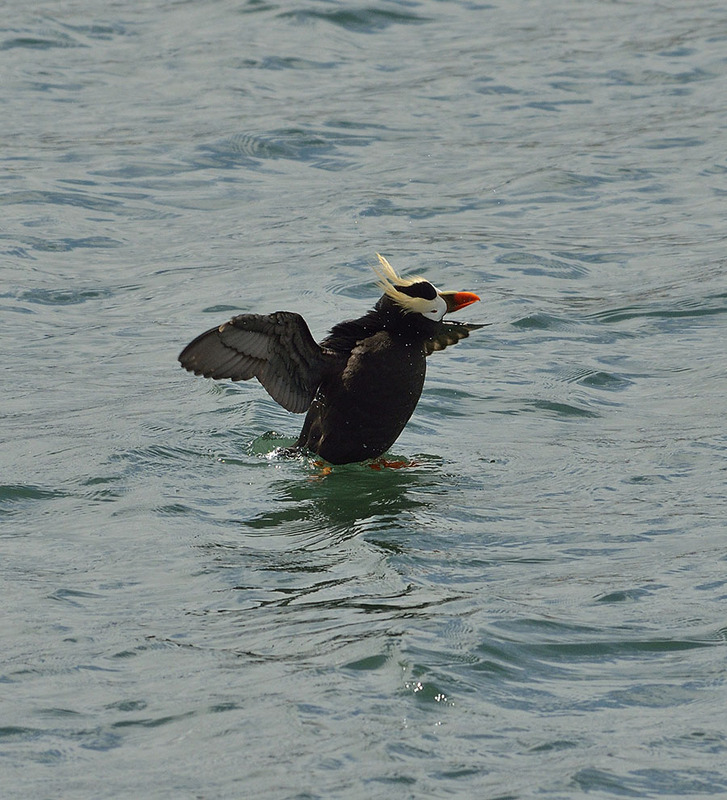 But then I decided to go for a little paddle in the kayak to photograph some birds along the shoreline, and had another wildlife adventure… that story will have to wait until the next post. Ah… Glacier Bay National Park. 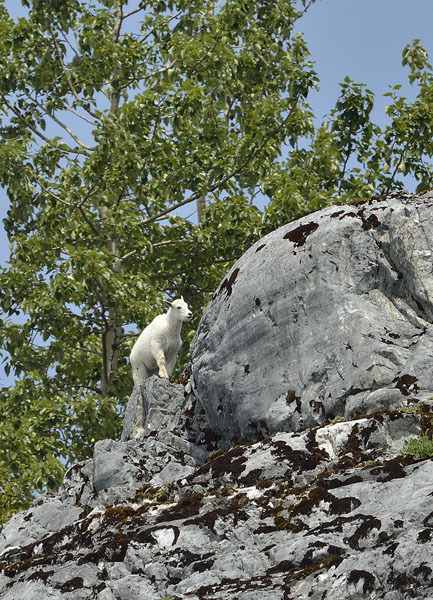 It’s an amazing place with a very high density of wildlife on top of wonderful scenery and plenty of glaciers – something for everyone. The entire Park is the size of Connecticut, though the area we were exploring is the main section with two long “arms”, each more than 50 miles long. 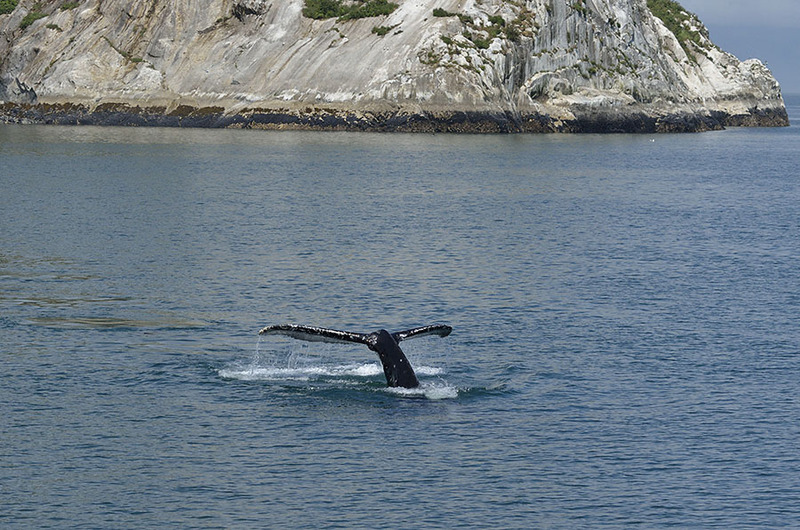 The Park controls the number of boats via a free permit system (so its popularity doesn’t cause crowding), and upon first entry you have to stop at the Ranger Station for a mandatory boater’s briefing, covering the rules for not interfering with humpback whales and seal pupping areas, as well as how to get weather information and assistance. Once we completed the briefing we were back aboard and ready to head “up bay”. 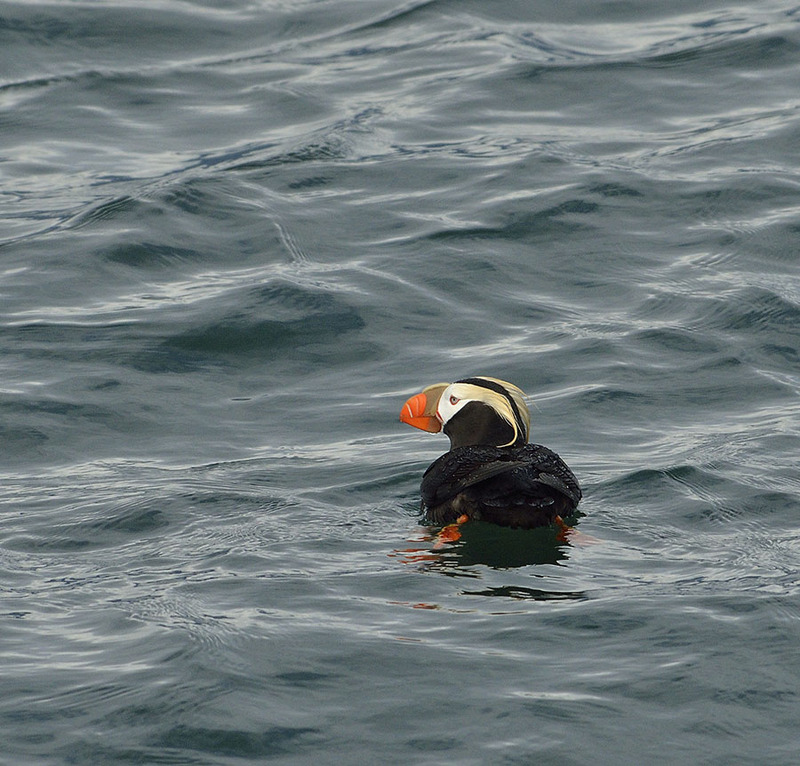 First stop: South Marble Island to see the Steller sea lions, puffins, nesting gulls and kittiwakes and cormorants. 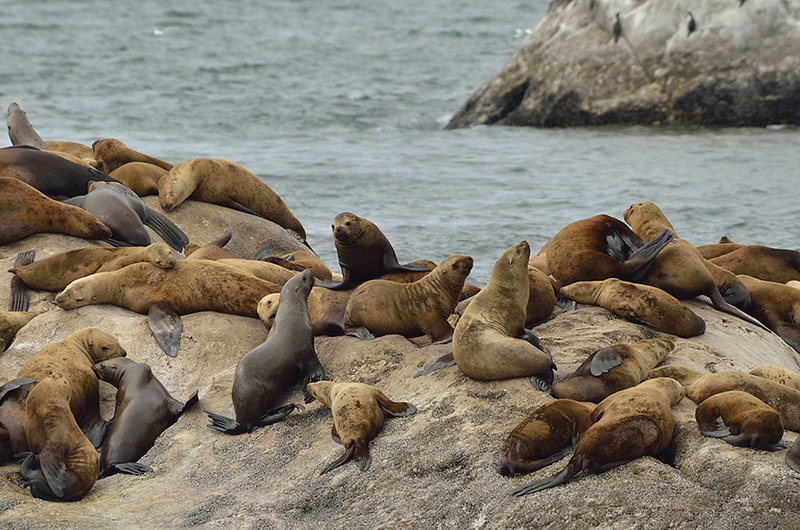 It was a breezy day, and as we loitered near the sea lion haulouts the aroma of sea lion habitat wafted over us. They bark, groan, moan, and generally fuss at each other in between lots of napping. We saw a few gigantic beachmasters, but we love to watch the younger ones playing in the water. 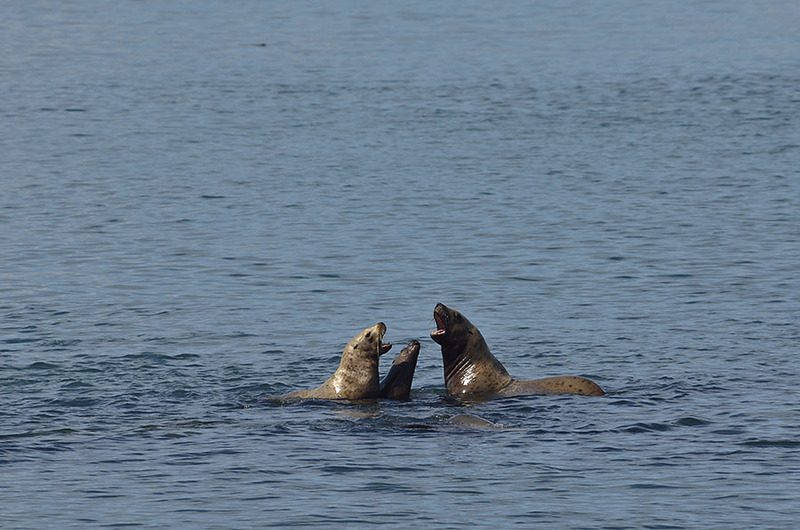 I photographed two different sea lions that had a number marked into their fur, and shared them with the Park biologist who was happy to get a report of their condition and location. There’s a lot of science that goes on in the Park every day, and visitors report interesting sightings to the Rangers to contribute to the effort. 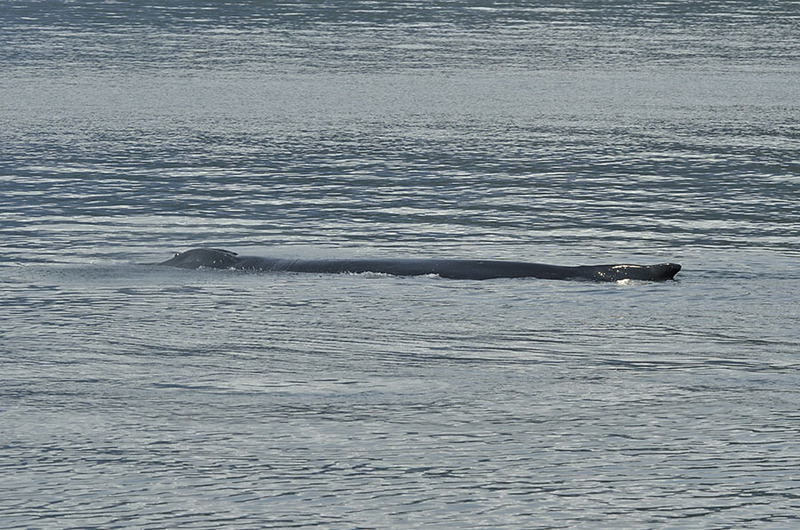 After enjoying the noise and aroma of sea lions, we eased towards the cliff where a lot of puffins congregate… but not before we had a visit from a humpback – awesome! 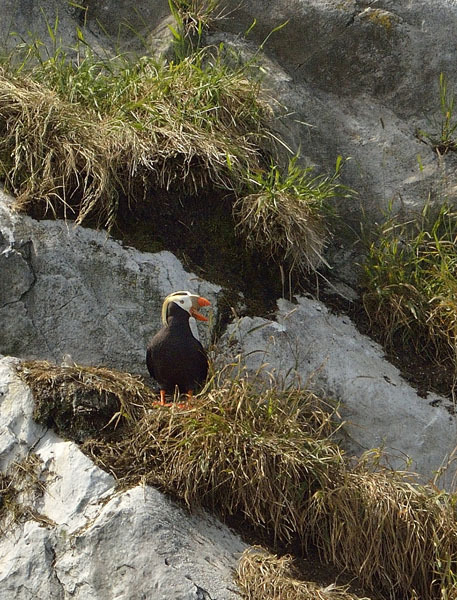 The tufted puffins were preening and primping, shaking their heads and flipping their golden tresses around – the tufts are present during breeding season. These sea birds spend most of the year on the ocean, except in summer when they dig burrows in cliffs to raise their young. They’re just adorable little birds, and we watched them for a long time. 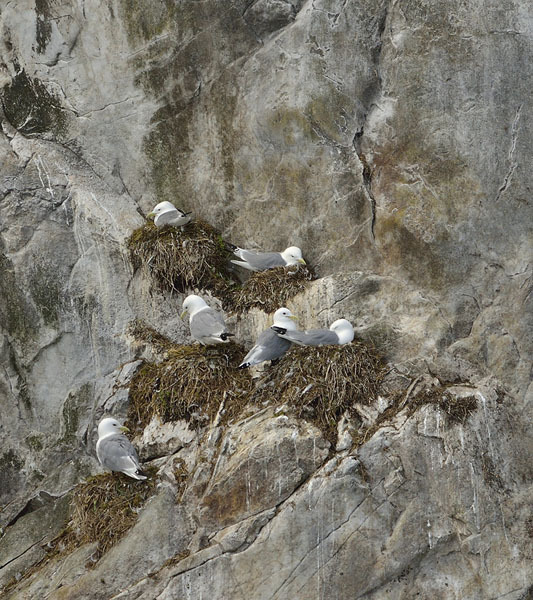 Kittiwakes and some gulls also nest on the cliffs, clinging to the rock face. Cormorants were plentiful along with the other birds, and I even spotted one horned puffin among all the tufted ones. There are a group of islands not far from South Marble where only non-motorized boats are allowed, and I’ve always wanted to explore the area by kayak. Jim generously offered to drop me off on one side of the island group, and then meet me on the other side a few hours later – what a great opportunity! 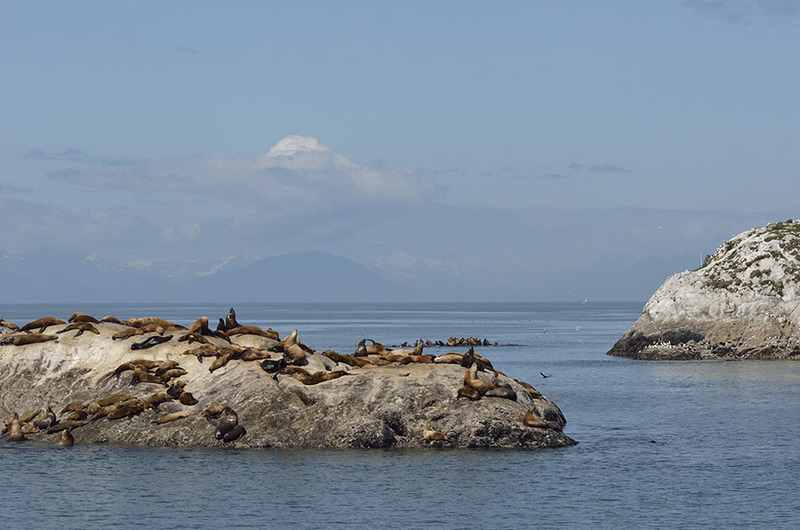 Unfortunately the wind picked up and it was against me for the entire time, but I saw sea otters and lots of seals (“rubberheads”), as well as huge flocks of birds. 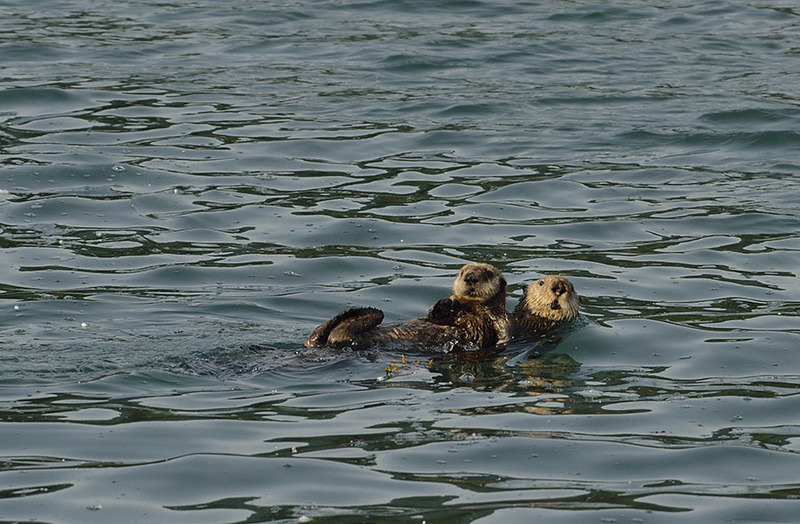 I love the otters with pups, clutching their little “mini-me” to their chests. I expected to see more deer or bears or maybe a wolf on land, but it was very quiet. 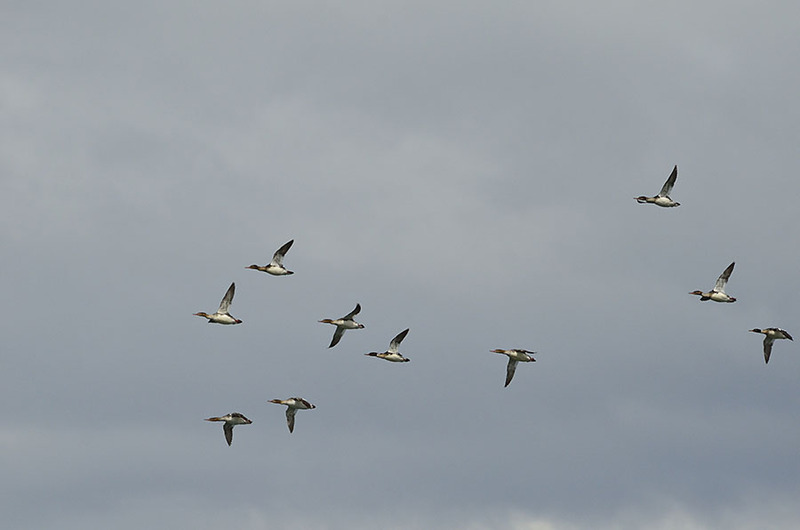 A few of the islands are nesting areas for different birds, so I kept my distance from those. It was a long paddle against the wind but I was happy to explore some new territory, and Jim saw some whales and otters on his trip with the big boat around to the other side. Any exploration of the western arm of the bay has to include a slow pass by Gloomy Knob, a bare mountain that comes right down to the water’s edge – we can bring ADVENTURES quite close to it since the water is so deep. Our shoulders ached after holding binoculars up for so many hours, but we were skunked – no mountain goats, no bears, and only one eagle near a nest. We heard reports on the radio of a wolf sighting farther north near Russell Pass, so we headed up there to look… but luck wasn’t on our side. 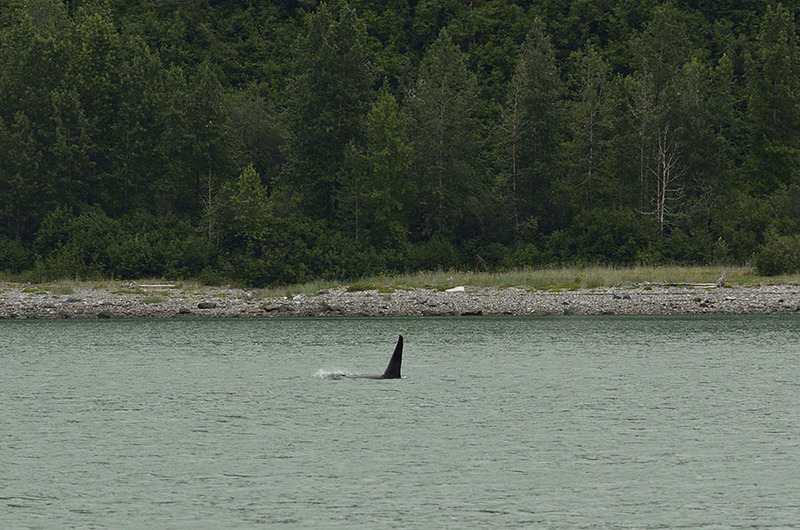 We also heard reports on the radio of orca sightings, so we hugged the shoreline near the reported area. The rumored 5-7 orcas weren’t around, but we finally spotted one lone male cruising around. The male orca has a very tall dorsal fin – 5-6′, so it really stands out! 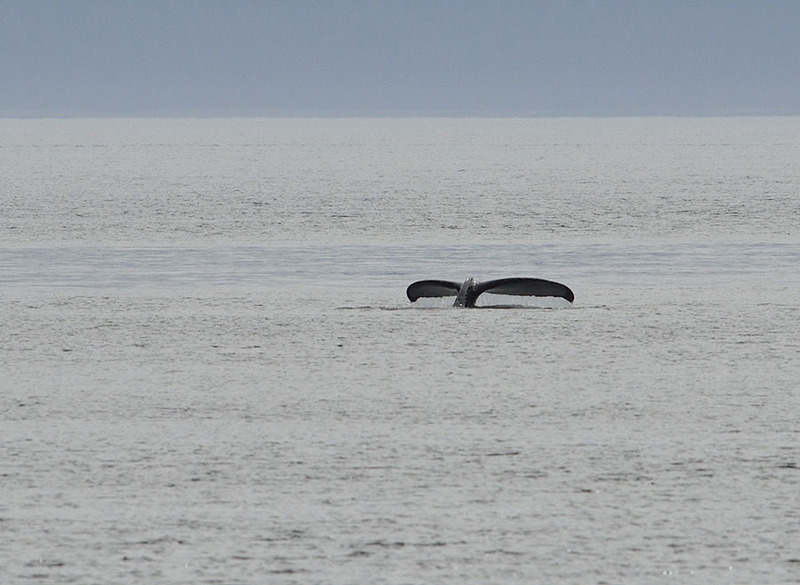 While there are many humpbacks in the bay (as well as all over SE Alaska), orcas are far less common to see. We chose a new anchorage for the night, and were focused on navigating across a narrow area between two rocky bars. As we got closer to the shoreline, I spotted a large brown bear on the point – but I couldn’t watch him – I had to pay attention. 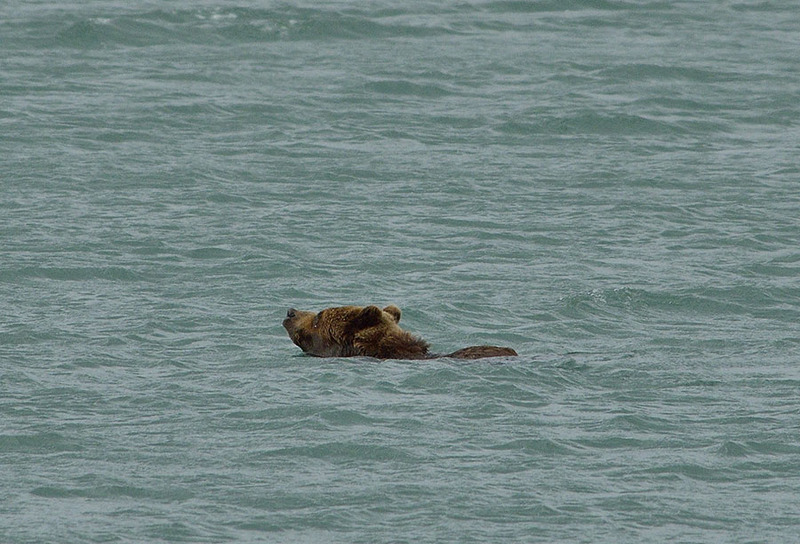 As we slowed down to navigate the entrance channel, I saw the bear swimming across the channel – in our path. He came towards ADVENTURES, but as we got closer he turned around and swam back the way he came until we passed. Then he resumed his 3/4 mile swim from the island back to the mainland. Fantastic! There are more tales (tails?) from Glacier Bay to share… stay tuned. From Red Bluff we tried to stop in Warm Springs Bay for a nice soak in the geothermal pools, but the seiners were waiting for an opening in the fishery and the place was packed so we headed a few miles north to Takatz Bay – a gorgeous place with waterfalls. From Takatz we decided to head directly to Hoonah, an 81 mile trip, but we were able to get a short-notice permit for Glacier Bay so it made sense to get as close to the Park as possible. Of course we saw whales along the way. We like Hoonah – it has a friendly, laid-back vibe. We caught up on news with the Harbormaster Sherry and her assistant, and we had lunch at our favorite stop there – Chipperfish. The barge had just arrived so we could get some fresh produce at the Trading Company – part grocery store, part hardware and miscellaneous store, and fuel dock. 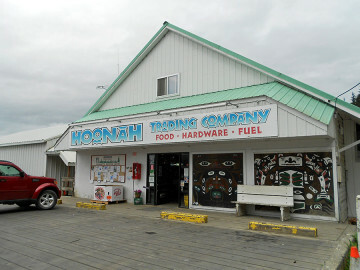 Hoonah is a Tlingit community, and it is where the Huna Tlingit resettled after the Little Ice Age pushed them out of their ancestral lands at the mouth of Glacier Bay. They have been in this area for over 10,000 years. 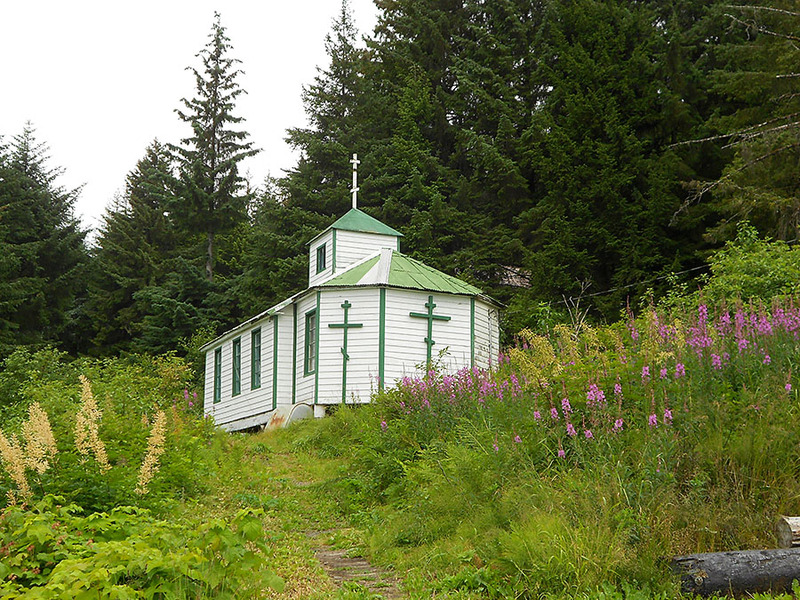 Any good Tlingit community has a Russian Orthodox church, owing to the inclusiveness of the church when it began to establish itself in Alaska. Rather than shun the tribal customs, the church adapted to them and continues to be a dominant religion among the Tlingit people today. 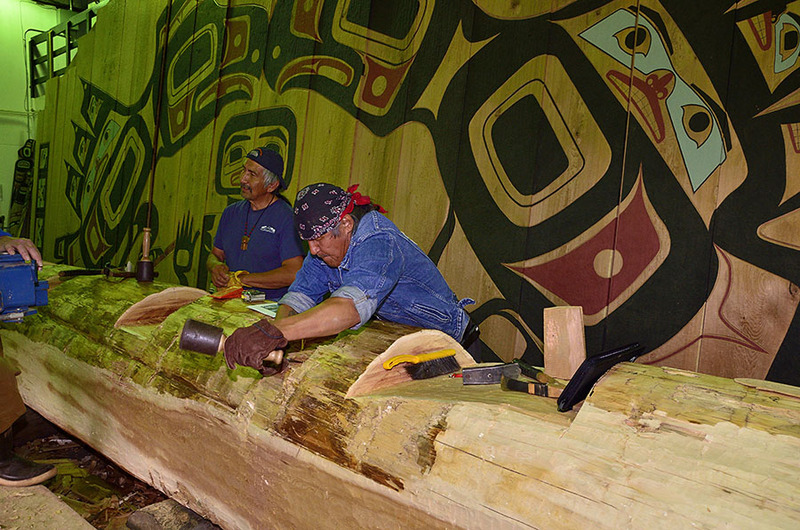 Our favorite folks in Hoonah are the carvers, working for several years on all the components of a Tribal House to be constructed in Glacier Bay National Park in the next year. They are amazing, talented, interesting people, and we always learn things when we listen to them talk about the carvings, the traditions, the attitudes, and their interest in promoting their culture and history. 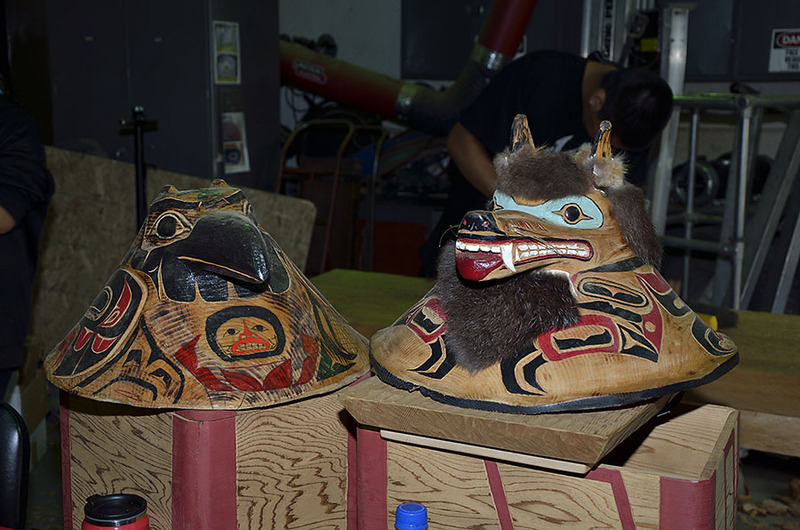 This will be the front door of the Tribal House, and the two large symbols are the Raven and the Eagle – representing the two Tlingit moities. The carving shed has big totems and small pieces, as well as wall panels. 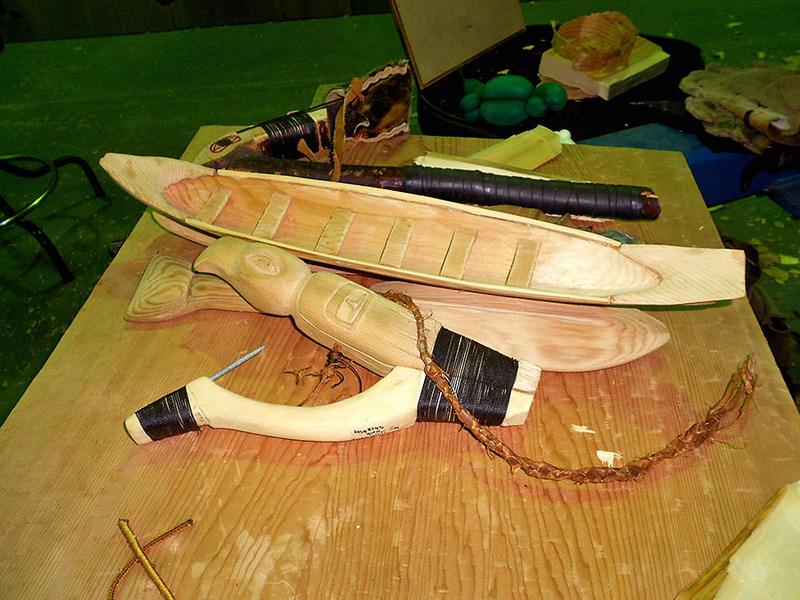 Those huge wall panels have all been sealed from the weather by using the adze to close the pores of the wood – a tremendous amount of work, on top of the designs and artistry. Each piece, each detail has a purpose and a story. 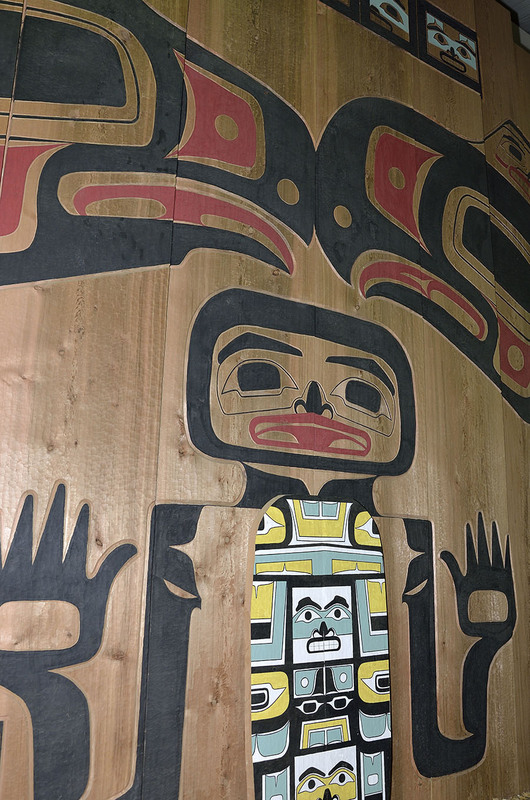 The Park Service is slowly recognizing the significance of the Huna Tlingit’s tribal lands that it now calls Glacier Bay National Park, and it’s encouraging to see the Tribal House project, but more can be done. We ran into our friend Howard, a retired Alaska State Trooper, who has lots of great stories and a lot of good information about trolling and salmon since he’s now fishing commercially. Using his special technique for bleeding the salmon, his kings were the most gorgeous and perfect fish. I’m finally getting more familiar with my new underwater camera system, so I spent some time photographing the life around the dock. 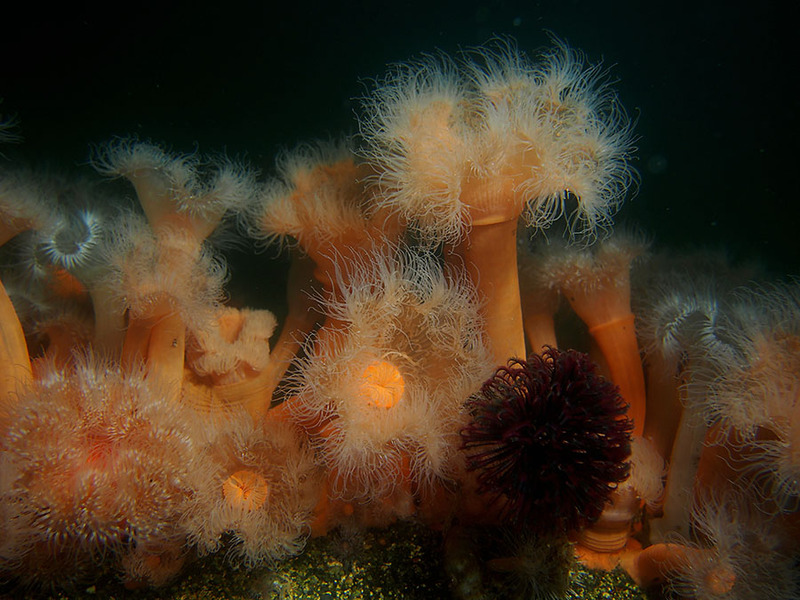 The plumose anemones weren’t as big as in Little Port Walter, but they were healthy and plentiful. 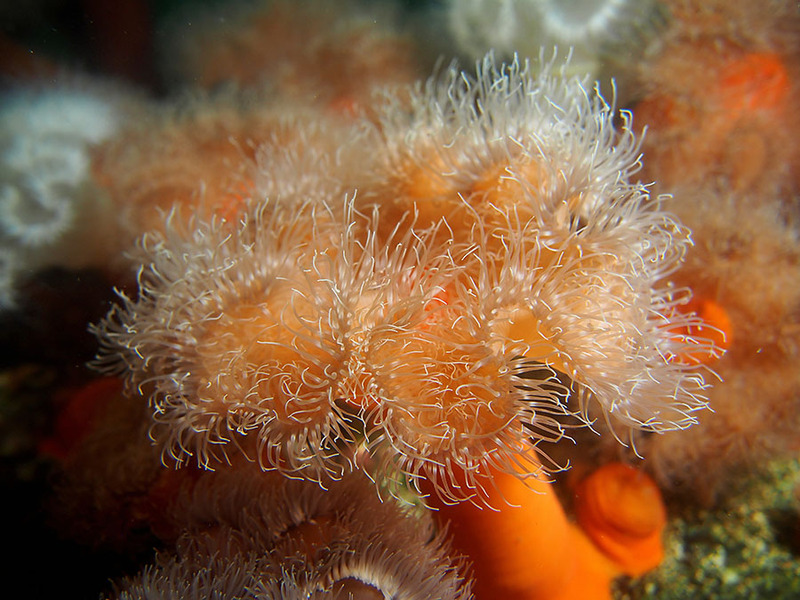 This grouping even had a plum-colored feather duster worm. 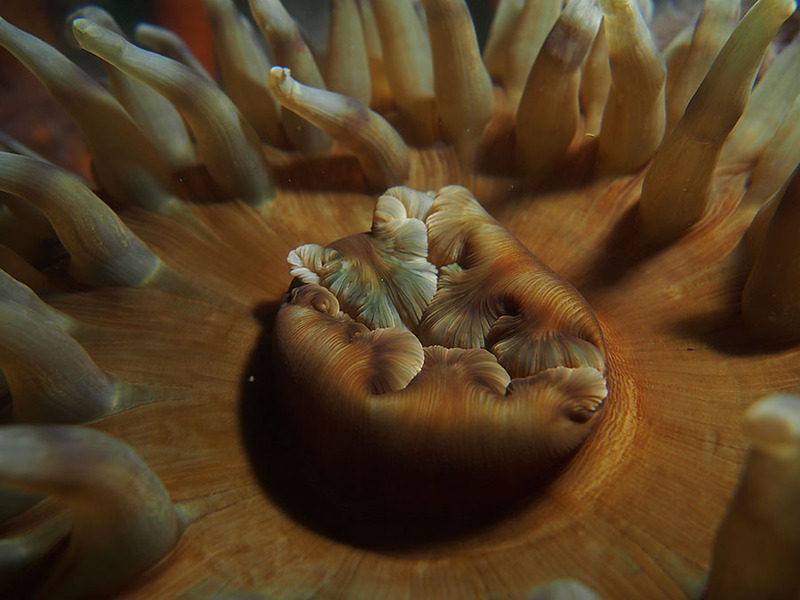 And this one is my favorite – an anemone’s mouth. 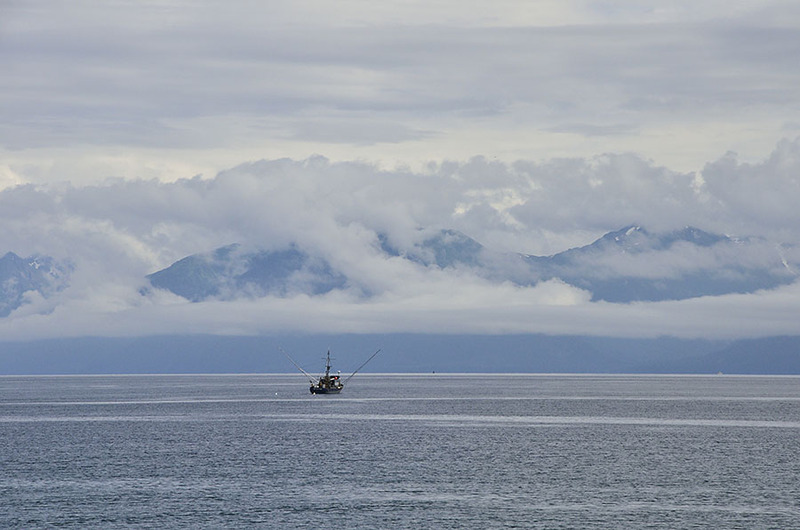 It was time to head to Glacier Bay for a different set of adventures… so stay tuned.